The aboriginal nations of New Brunswick include the Mi'kmaq, Maliseet/Wəlastəkwiyik and Passamaquoddy. The Mi'kmaw territories are mostly in the east of the province. The Maliseets are located along the length of the St. John River, and the Passamaquoddy are situated in the southwest, around Passamaquoddy Bay. Amerindians have occupied New Brunswick for at least 13,000 years. The "Maliseet" (also known as Wəlastəkwiyik, and in French as Malécites or Étchemins (the latter collectively referring to the Maliseet and Passamaquoddy)) are a First Nations people who inhabit the St. John River valley and its tributaries, extending to the St. Lawrence in Quebec. Their territory included the entire watershed of the St. John River on both sides of the International Boundary between New Brunswick and Quebec in Canada, and Maine in the United States. Wəlastəkwiyik is the name (and Maliseet spelling) for the people of the St. John River, and Wəlastəkwey is their language. (Wolastoqiyik is the Passamaquoddy spelling of Wəlastəkwiyik.) Maliseet is the name by which the Mi'kmaq described the Wəlastəkwiyik to early Europeans since the Wəlastəkwey language seemed to the Mi'kmaq to be a slower version of the Mi'kmaw language. The Wəlastəkwiyik so named themselves because their territory and existence centered on the St. John River which they called the Wəlastəkw. It meant simply "good river" for its gentle waves; "wəli" = good or beautiful, shortened to "wəl-" when used as modifier; "təkw" = wave; "-iyik" = the people of that place. Wəlastəkwiyik therefore means People of the Good [Wave] River, in their own language. Before contact with the Europeans, the traditional culture of both the Maliseet and Passamaquoddy generally involved travelling downriver in the spring to fish and plant crops, largely of corn (maize), beans, squash, and to hold annual gatherings. Then they travelled to the saltwater for the summer, where they harvested seafoods and berries. In the early autumn they travelled upstream to harvest their crops and prepare for the winter. After the harvest, they dispersed in small family groups to their hunting grounds at the headwaters of the various tributaries to hunt and trap during the winter. The Passamaquoddy (Peskotomuhkati or Pestomuhkati in the Passamaquoddy language) are a First Nations people who live in northeastern North America, in Maine and New Brunswick. Like the Maliseet, the Passamaquoddy maintained a migratory existence, but in the woods and mountains of the coastal regions along the Bay of Fundy and Gulf of Maine and along the St. Croix River and its tributaries. They dispersed and hunted inland in the winter; in the summer, they gathered more closely together on the coast and islands and farmed corn, beans, and squash, and harvested seafood, including porpoise. The name Passamaquoddy is an anglicization of the Passamaquoddy word Peskotomuhkatiyik, the name they applied to themselves. Peskotomuhkat literally means "pollock-spearer", reflecting the importance of this fish. Like the Maliseet, their method of fishing was spear-fishing rather than angling. The Passamaquoddy were moved off land repeatedly by European settlers since the 16th century and were eventually confined in the United States to two reservations, one at Indian Township near Princeton and the other at Sipayik, between Perry and Eastport in eastern Washington County, Maine. The Passamaquoddy also live in Charlotte County, New Brunswick, and have recently acquired legal status in Canada as a First Nation. They are currently pursuing the return of lands in the county, including Qonasqamkuk, their name for St. Andrews, New Brunswick which was the ancestral capital of the Passamaquoddy. The Mi'kmaq (previously spelled Micmac in English texts) are a First Nations people, indigenous to Nova Scotia, Prince Edward Island, the Gaspe peninsula in Quebec and the eastern half of New Brunswick in the Maritime Provinces. Míkmaw is the name of their language and the adjective form of Míkmaq. In 1616 Father Biard believed the Mi'kmaw population to be in excess of 3,000. However, he remarked that, because of European diseases, including smallpox, there had been large population losses in the previous century. During the colonial wars the Mi'kmaq were allies with the four Abenaki nations [Abenaki, Penobscot, Passamaquoddy and Maliseet], forming the Wabanaki Confederacy, pronounced [wɑbɑnɑːɣɔdi]. At the time of contact with the French (late 16th century) they were expanding from their Maritime base westward along the Gaspé Peninsula /St. Lawrence River at the expense of Iroquioian peoples, hence the Mi'kmaq name for this peninsula, Gespedeg ("last-acquired"). They were amenable to limited French settlement in their midst, but as France lost control of Acadia in the 18th century, they soon found themselves overwhelmed by British (English, Irish, Scottish, Welsh) who seized much of the land without payment and deported the French. Later on the Mi'kmaq also settled Newfoundland as the unrelated Beothuk tribe became extinct. The first recorded European exploration of present-day New Brunswick was by French explorer Jacques Cartier in 1534, who discovered and named the Baie des Chaleurs between northern New Brunswick and the Gaspé peninsula of Quebec. The next French contact was in 1604, when a party led by Pierre Dugua (Sieur de Monts) and Samuel de Champlain sailed into Passamaquoddy Bay and set up a camp for the winter on St. Croix Island at the mouth of the St. Croix River. 36 out of the 87 members of the party died of scurvy by winter's end and the colony was relocated across the Bay of Fundy the following year to Port-Royal in present-day Nova Scotia. Gradually, other French settlements were destroyed and seigneuries were founded. These were located along the Saint John River and present-day Saint John (including Fort La Tour and Fort Anne), the upper Bay of Fundy (including a number of villages in the Memramcook and Petitcodiac river valleys and the Beaubassin region at the head of the bay), and St. Pierre, (founded by Nicolas Denys) at the site of present-day Bathurst on the Baie des Chaleurs. The whole region of New Brunswick (as well as Nova Scotia, Prince Edward Island and parts of Maine) were at that time proclaimed to be part of the royal French colony of Acadia. The French maintained good relations with the First Nations during their tenure and this was principally because the French colonists kept to their small coastal farming communities, leaving the interior of the territory to the aboriginals. This good relationship was bolstered by a healthy fur trading economy. A competing British (English and Scottish) claim to the region was made in 1621, when Sir William Alexander was granted, by James VI & I, all of present-day Nova Scotia, New Brunswick and part of Maine. The entire tract was to be called '"Nova Scotia", Latin for "New Scotland". Naturally, the French did not take kindly to the British claims. France however gradually lost control of Acadia in a series of wars during the 18th century. 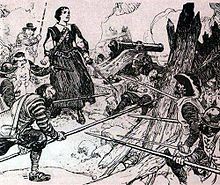 Acadia was plunged into what some historians have described as a civil war in Acadia (1640–1645). The war was between Port Royal, where Governor of Acadia Charles de Menou d'Aulnay de Charnisay was stationed, and present-day Saint John, New Brunswick, where Charles de Saint-Étienne de la Tour was stationed. The Maliseet from their headquarters at Meductic on the Saint John River, participated in numerous raids and battles against New England during King William's War. A map of the 1713 Treaty of Utrecht. One of its provisions of the Treaty of Utrecht of 1713, which formally ended the Queen Anne's War, was the surrender of peninsular Nova Scotia to the British crown. All of what later became New Brunswick, as well as "Île St-Jean" (Prince Edward Island) and "Île Royale" (Cape Breton Island) would remain under French control. The bulk of the Acadian population now found itself residing in the new British colony of Nova Scotia. The remainder of Acadia (including the New Brunswick region) was only lightly populated, with major Acadian settlements in New Brunswick only found at Beaubassin (Tantramar) and the nearby region of Shepody, Memramcook, and Petitcodiac, which they called Trois-Rivière, as well as in the Saint John River valley at Fort la Tour (Saint John) and Fort Anne (Fredericton). The colony of Acadia passed into British hands with the Treaty of Utrecht (1713), but the new owners were slow to occupy their new possession. Until the definitive peace in the Americas occasioned by the Treaty of Paris (1763), the region was subject to low-grade contention. The Maliseet from their headquarters at Meductic on the Saint John River, participated in numerous raids and battles against New England during Father Rale's War. During Father Le Loutre's War, in 1750, in order to protect their territorial interests in what remained of Acadia, France built three forts (Fort Beauséjour, Fort Menagoueche and Fort Gaspareaux) along the frontier with Nova Scotia. (A major French fortification (Fortress of Louisbourg) was also built on Île Royale (now Cape Breton Island) after Queen Anne's War, but the function of this fort was mostly to defend the approaches to the colony of Canada, not Acadia.) During this time there were numerous raids and battles at Chignecto. The British Conquest of Acadia happened in 1710. Over the next forty-five years the Acadians refused to sign an unconditional oath of allegiance to Britain. During this time period Acadians participated in various militia operations against the British and maintained vital supply lines to the French Fortress of Louisbourg and Fort Beausejour. During the French and Indian War, the British sought both to neutralize any military threat Acadians posed and to interrupt the vital supply lines Acadians provided to Louisbourg by deporting Acadians from Acadia. After the Siege of Louisbourg (1758), the second wave of the Expulsion of the Acadians began. Moncton was sent on the St. John River Campaign and the Petitcodiac River Campaign. Commander Rollo accomplished the Ile Saint-Jean Campaign. And Wolfe was sent on the Gulf of St. Lawrence Campaign. In the Gulf of St. Lawrence Campaign (1758), the British wanted to clear the Acadians from the villages along the Gulf of St. Lawrence to prevent any interference with the Siege of Quebec (1759). Fort Anne fell during the St. John River Campaign and following this, all of present-day New Brunswick came under British control. France ultimately lost control of all of its North American territories by 1760. In the Treaty of Paris (1763), which put a close to the wider hostilities between Britain, France and Spain, was recognised the eviction of France from North America. After the Seven Years' War, which is the name for the North American part of these hostilities, most of what is now New Brunswick (and parts of Maine) was incorporated into the colony of Nova Scotia as Sunbury County (county seat - Campobello). New Brunswick's relative location away from the Atlantic coastline hindered new settlement during the immediate post war period. There were a few notable exceptions, such as the founding of "The Bend" (present-day Moncton) in 1766 by Pennsylvania Dutch settlers sponsored by Benjamin Franklin's Philadelphia Land Company. Other American settlements developed, principally in former Acadian lands in the southeast region, especially around Sackville. An American settlement also developed at Parrtown (Fort la Tour) at the mouth of the Saint John River. English settlers from Yorkshire also arrived in the Tantramar region near Sackville prior to the Revolutionary War. The American Revolutionary War had a direct effect on the New Brunswick region: the Maugerville Rebellion (1776), the Battle of Fort Cumberland, Siege of Saint John (1777) and the Battle at Miramichi (1779). Significant population growth would not occur until after the American Revolution, when Britain convinced refugee Loyalists from New England to settle in the area by giving them free land. Some earlier American settlers in New Brunswick actually favoured the colonial revolutionary cause. In particular, Jonathan Eddy and his militia harassed and laid siege to the British garrison at Fort Cumberland (the renamed Fort Beausejour) during the early parts of the American Revolution. It was only after the arrival of a relief force from Halifax that the siege was lifted. With the arrival of the Loyalist refugees in Parrtown (Saint John) in 1783, the need to politically organize the territory became acute. The newly arrived Loyalists felt no allegiance to Halifax and wanted to separate from Nova Scotia to isolate themselves from what they felt to be democratic and republican influences existing in that city. They felt that the government of Nova Scotia represented a Yankee population which had been sympathetic to the American Revolutionary movement, and which disparaged the intensely anti-American, anti-republican attitudes of the Loyalists. "They [the loyalists]," Colonel Thomas Dundas wrote from Saint John, New Brunswick, December 28, 1786, "have experienced every possible injury from the old inhabitants of Nova Scotia, who are even more disaffected towards the British Government than any of the new States ever were. This makes me much doubt their remaining long dependent." These views undoubtedly were exaggerated but there was no love lost between the Loyalists and the Halifax establishment and the feelings of the newly arrived Loyalists helped to sow the seeds for partition of the colony. The election of 1786 was bitterly contested and pitted two concepts of loyalty to the Empire against one another: loyalty to the King and his appointed governors, and loyalty to the King with local affairs handled by the locals. Hundreds who protested a rigged election and signed a petition to call another election were arrested for sedition: the issue of what loyalty meant was at the center of Canadian 19th century politics. This event replicated the pre-1775 behavior and attitude of both Tories and Whigs in the southern 13 Colonies who protested their loyalty to the King and pride in belonging to the British Empire while insisting on their rights as British subjects, local rule and fair governance. The British administrators of the time, for their part, felt that the colonial capital (Halifax) was too distant from the developing territories to the west of the Isthmus of Chignecto to allow for proper governance and that the colony of Nova Scotia therefore should be split. As a result, the colony of New Brunswick was officially created with Sir Thomas Carleton the first governor on August 16, 1784. The choice of Fredericton (the former Fort Anne) as the colonial capital shocked and dismayed the residents of the larger Parrtown (Saint John). The reason given was because Fredericton's inland location meant it was less prone to enemy (i.e. American) attack. Saint John did, however, become Canada's first incorporated city and for over a century was one of the dominant communities in British North America. Saint John in 1787-91 was home to the American traitor Benedict Arnold. He was an aggressive businessman who sued a great deal and had a negative reputation by the time he quit and went to London. In 1819, the ship Albion left Cardigan for New Brunswick, carrying the first Welsh settlers to Canada; onboard were 27 Cardigan families, many of whom were farmers. Saint John has often been called "Canada's Irish City". In the years between 1815, when vast industrial changes began to disrupt the old life-styles in Europe, and Canadian Confederation in 1867, when immigration of that era passed its peak, more than 150,000 immigrants from Ireland flooded into Saint John. Those who came in the earlier period were largely tradesmen, and many stayed in Saint John, becoming the backbone of its builders. But when the Great Irish Potato Famine raged between 1845-1852, huge waves of Famine refugees flooded these shores. It is estimated that between 1845 and 1847, some 30,000 arrived, more people than were living in the city at the time. In 1847, dubbed "Black 47," one of the worst years of the Famine, some 16,000 immigrants, most of them from Ireland, arrived at Partridge Island, the immigration and quarantine station at the mouth of Saint John Harbour. However, thousands of Irish were living in New Brunswick prior to these events, mainly in Saint John and the Miramichi River valley. The Irish language survived as a community language in New Brunswick into the twentieth century. The 1901 census specifically enquired as to the mother tongue of the respondents, defining it as a language commonly spoken in the home. There were several individuals and a scattering of families in the census who described Irish as their first language and as being spoken at home. In other respects the respondents had less in common, some being Catholic and some Protestant. Some deported Acadians from Nova Scotia found their way back to "Acadie" during the late 18th and early 19th centuries. They settled mostly in coastal regions along the eastern and northern shores of the new colony of New Brunswick. There they lived in relative (and in many ways self-imposed) isolation as they tried to maintain their language and traditions. The War of 1812 had little effect on New Brunswick proper. There was however some action on the waters of the Bay of Fundy and Gulf of Maine by privateers and small vessels of the British navy. Forts such as the Carleton Martello Tower in Saint John and the St. Andrew's Blockhouse on Passamaquoddy Bay were constructed, but no action was seen. Locally, New Brunswickers were on good terms with their neighbours in Maine as well as the rest of New England, who generally did not support the war. There was even one incident during the war where the town of St. Stephen lent its supplies of gunpowder to neighbouring Calais, Maine, across the St. Croix River, for the local Fourth of July Independence Day celebrations. That being said, New Brunswick's contribution to the war effort in Upper Canada was significant in terms of troop contribution. In the winter of 1813, the locally-mustered 104th Regiment of Foot (New Brunswick), the only regular regiment in the British Army raised outside the British Isles at the time, marched overland from Fredericton to Kingston, an epic journey documented in the war diary of John Le Couteur. Once in Upper Canada, the 104th fought in some of the most significant actions of the war, including the Battle of Lundy's Lane, the Siege of Fort Erie and the raid on Sacket's Harbour. The Old Arts Building at the University of New Brunswick, 1829, the oldest university building still in use in Canada. The Maine-New Brunswick frontier had not been defined by the Treaty of Paris (1783) which had concluded the Revolutionary War. The border was contested, and frequently this fact was taken advantage of by people on both sides of the border to engage in a lively smuggling trade, especially on the waters of Passamaquoddy Bay. The illicit trade in Nova Scotia gypsum resulted in the so-called "Plaster War" of 1820. By the 1830s competing lumber interests and immigration meant that a solution was required. The situation actually deteriorated sufficiently enough by 1842 that the Governor of Maine called out his militia. This was followed by the arrival of British troops in the region shortly thereafter. The entire debacle, referred to as the Aroostook War, was bloodless - unless one counts the mauling by bears at the Battle of Caribou - and thankfully, cooler heads prevailed with the subsequent Webster-Ashburton Treaty settling the dispute. Some local residents in the Madawaska region did not care much one way or the other as to who would actually win control of the area. When one resident of Edmundston was asked by arbitrators which side he supported, he replied "the Republic of Madawaska". This name is still used today and describes the northwestern corner of the province. Immigration in the early part of the 19th century was mostly from the west country of England and from Scotland, but also from Waterford, Ireland having often come through or having lived in Newfoundland prior. A large influx of Catholic settlers arrived in New Brunswick in 1845 from Ireland as a result of the Potato Famine. They headed to the cities of Saint John or Chatham, which to this day calls itself the "Irish Capital of Canada". Established Protestants resented the newly arrived Catholics. Until the 1840s, Saint John, the major city of New Brunswick, was a largely homogenous, Protestant community. Combined with a decade of economic distress in New Brunswick, the immigration of poor unskilled labourers triggered a nativist response. The Orange Order, until then a small and obscure fraternal order, became the vanguard of nativism in the colony and stimulated Orange-Catholic tension. The conflict culminated in the riot of 12 July 1849, in which at least 12 people died. The violence subsided as Irish immigration declined. Throughout the 19th century, shipbuilding, beginning in the Bay of Fundy with shipbuilders like James Moran in St. Martins and soon spreading to the Miramichi, became the dominant industry in New Brunswick. The ship Marco Polo, arguably the fastest clipper ship of her time was launched from Saint John in 1851. Noted shipbuilders like Joseph Salter laid the foundations of towns such as Moncton. Resource-based industries such as logging and farming were also important to the New Brunswick economy. From the 1850s through to the end of the century, several railways were built across the province, making it easier for these inland resources to make it to markets elsewhere. New Brunswick was one of the four original provinces of Canada that entered into Confederation in 1867. The Charlottetown Conference of 1864 had originally been intended only to discuss a Maritime Union of New Brunswick, Nova Scotia and Prince Edward Island, but concerns over the American Civil War as well as Fenian activity along the border led to an interest in expanding the geographic scope of the union. This interest arose from the Province of Canada (formerly Upper and Lower Canada, later Ontario and Quebec) and a request was made by the Canadians to the Maritimers to have the meeting's agenda altered. Following Confederation, the naysayers were proven right and New Brunswick (as well as the rest of the Maritimes) suffered the effects of a significant economic downturn. New national policies and trade barriers that had been created as a result of Confederation disrupted the historic trading relationship between the Maritime Provinces and New England. In 1871, the legislature sent a delegation to Ottawa in order to renew on "better terms". The situation in New Brunswick was exacerbated by the Great Fire of 1877 in Saint John and by the decline of the wooden sailing shipbuilding industry. The global recession sparked by the Panic of 1893 significantly affected the local export economy. Many skilled workers lost their jobs and were forced to move west to other parts of Canada or south to the United States, but as the 20th Century dawned, the province's economy began to expand again. Manufacturing gained strength with the construction of several textile mills across the province and, in the crucial forestry sector, the sawmills that had dotted inland sections of the province gave way to larger pulp and paper mills. Nevertheless, unemployment remained relatively high and the Great Depression provided another setback. Two influential families, the Irvings and the McCains, emerged from the depression to begin to modernize and vertically integrate the provincial economy. The Acadians, who had mostly fended for themselves on the northern and eastern shores since they were allowed to return after 1764, were traditionally isolated from the English speakers that dominated the rest of the province. Government services were often not available in French, and the infrastructure in predominantly francophone areas was noticeably less evolved than in the rest of the province. This changed with the election of premier Louis Robichaud in 1960. He embarked on the ambitious Equal Opportunity Plan in which education, rural road maintenance, and health care fell under the sole jurisdiction of a provincial government that insisted on equal coverage of all areas of the province. Teachers were awarded equal rates of pay regardless of enrollment. County councils were abolished with the rural areas outside cities, towns and villages coming under direct provincial jurisdiction. The 1969 Official Languages Act made French an official language, on par with English. Linguistic tensions rose on both sides, with the militant Parti Acadien enjoying brief popularity in the 1970s and Anglophone groups pushing to repeal language reforms in the 1980s, led by the Confederation of Regions Party. By the 1990s however linguistic tensions had mostly evaporated. Acheson, Thomas W. (1993). Saint John: The Making of a Colonial Urban Community. University of Toronto Press. ISBN 978-1-4426-5509-6. Andrew, Sheila (2002). "Gender and Nationalism: Acadians, Québécois, and Irish in New Brunswick Nineteenth-Century Colleges and Convent Schools, 1854-1888" (PDF). Historical Studies. Canadian Catholic Historical Association. 68: 7–23. Andrew, Sheila M. (1996). Development of Elites in Acadian New Brunswick, 1861-1881. McGill-Queen's University Press. ISBN 978-0-7735-1508-6. Aunger, Edmund A. (1981). In Search of Political Stability: A Comparative Study of New Brunswick and Northern Ireland. McGill-Queen's University Press. ISBN 978-0-7735-0366-3. Barkley, Murray (Spring 1975). "The Loyalist Tradition in New Brunswick: the Growth and Evolution of an Historical Myth, 1825-1914". Acadiensis. 4 (2): 3–45. JSTOR 30302493. Benedict, William H. (1925). New Brunswick in History. the author. Bell, David Graham (1983). Early Loyalist Saint John: The Origin of New Brunswick Politics, 1783-1786. New Ireland Press. ISBN 978-0-9690215-8-2. Deschamps, Isaac; Brenton, James (1784). The Perpetual Acts of the General Assemblies of His Majesty's Province of Nova Scotia: As Revised in the Year 1783. [1758-1783]. Halifax: Anthony Henry. Gair, W. Reavley (1985). A Literary and linguistic history of New Brunswick. Fiddlehead Poetry Books & Goose Lane Editions. ISBN 978-0-86492-052-2. Godfrey, W.G. (1983). "Carleton, Thomas". In Halpenny, Francess G (ed.). Dictionary of Canadian Biography. V (1801–1820) (online ed.). University of Toronto Press. MacNutt, W. Stewart (1984). New Brunswick, a History: 1784-1867. Macmillan of Canada. ISBN 978-0-7715-9818-0. Mancke, Elizabeth (2005). The Fault Lines of Empire: Political Differentiation in Massachusetts and Nova Scotia, Ca. 1760-1830. Routledge. ISBN 978-0-415-95000-8. Marquis, Greg (Fall 2004). "Commemorating the Loyalists in the Loyalist City: Saint John, New Brunswick, 1883-1934". Urban History Review. 33 (1): 24–33. doi:10.7202/1015672ar. JSTOR 43560111. Nerbas, Don (June 2008). "Adapting to Decline: the Changing Business World of the Bourgeoisie in Saint John, NB, in the 1920s". Canadian Historical Review. 89 (2): 151–187. doi:10.3138/chr.89.2.151. Petrie, Joseph Richards (1944). Report of the New Brunswick Committee on Reconstruction. Fredericton. Richard, Chantal; Brown, Anne; Conrad, Margaret; et al. (2013). "Markers of Collective Identity in Loyalist and Acadian Speeches of the 1880s: A Comparative Analysis". Journal of New Brunswick Studies/Revue d’études sur le Nouveau-Brunswick. 4: 13–30. See, Scott W. (1993). Riots in New Brunswick: Orange nativism and social violence in the 1840s. University of Toronto Press. ISBN 978-0-8020-7770-7. Stewart, Ian (1994). Roasting Chestnuts: The Mythology of Maritime Political Culture. Vancouver: UBC Press. ISBN 978-0-7748-4273-0. Whitcomb, Edward A. (2010). A Short History of New Brunswick. Ottawa: From Sea To Sea Enterprises. ISBN 978-0-9865967-0-4. Woodward, Calvin A. (1976). The history of New Brunswick provincial election campaigns and platforms, 1866-1974: With primary source documents on microfiche. Report on Agriculture for the Province of New Brunswick. Fredericton: New Brunswick. Dept. of Agriculture. 1895. ^ "Passamaquoddy - Maliseet Dictionary". Lib.unb.ca. 2009-08-15. Retrieved 2010-09-22. ^ Fanny D. Bergen. "Popular American Plant-Names." The Journal of American Folklore 17: 89-106. ^ Dunn, Brenda (2004). A History of Port-Royal-Annapolis Royal, 1605-1800. Nimbus. p. 19. ISBN 978-1-55109-740-4. ^ admin (28 March 2014). "Chapter 3". unb.ca. ^ "The Winslow Papers: The Partition of Nova Scotia". ^ Wilson, Barry (2001). Benedict Arnold: A Traitor in Our Midst. McGill-Queen's Press. p. 191ff. ISBN 978-0-7735-2150-6. ^ "2019 marks bi-centenary of the Albion sailing from Cardigan to Canada". Tivyside Advertiser. 28 April 2018. Retrieved 15 February 2019. ^ Smith, Joshua (2007). Borderland Smuggling: Patriots, Loyalists, and Illicit Trade in the Northeast, 1780-1820. Gainesville, FL: UPF. pp. 95–108. ISBN 0-8130-2986-4.